It was back in August, but seems like an age ago now, when West Bromwich Albion, then under Tony Pulis, pulled off a smash-and-grab raid at Turf Moor to nick a one-nil win over the Clarets thanks to a goal from Hal Robson Kanu. Since that game the fortunes of the two clubs have taken sharply divergent paths; Burnley have enjoyed a season of solid progression, maintaining a position in the top ten throughout; whilst Albion have won only one further Premier League match and after defeat to Burnley at the Hawthorns on Saturday, are now facing life in the Championship without the manager they brought in to replace Pulis. Alan Pardew has today joined Frank De Boer, Ronald Koeman and Paul Clement on the roster of high-profile names to lose their jobs shortly after suffering defeat at the hands of Sean Dyche’s Burnley. 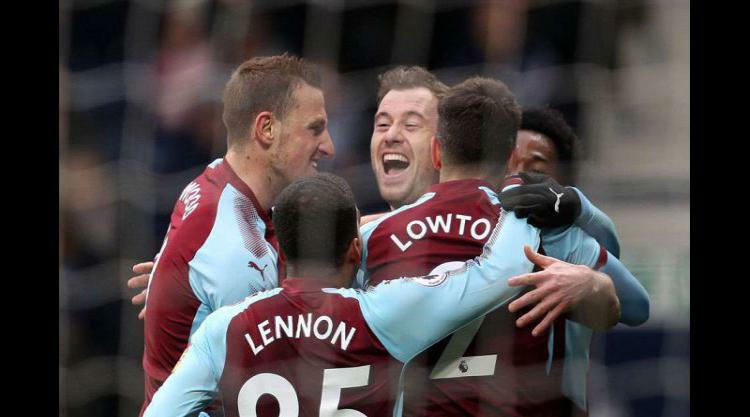 But whilst one has sympathy for Albion’s travails, they are of lesser concern than the warm glow of satisfaction to be gleaned from Burnley’s third successive win, a victory highlighted by a wonder goal from Ashley Barnes. Barnes, it is fair to say, is enjoying the form of his life, he has now scored in each of Burnley’s last four fixtures, from the goal-line scramble against Southampton to Saturday’s spectacular overhead kick, each of his goals has been more visually gratifying than the last. Adjusting as he gaged the trajectory of Aaron Lennon’s cross, he contorted his body to meet its flight; his eyes remaining fixed on the ball, he leapt high to allow his outstretched left foot to make contact with the ball and guide it into Albion’s goal; a superbly improbable feat of athleticism. This surge in form does not happen by accident, it is the product of the work Barnes and his colleagues put in on the training ground day in and day out, it is the product too of confidence both in Barnes’ own ability and in that of his teammates. Of those teammates, Chris Wood and Aaron Lennon also deserve a mention. Since being paired together in attack, Wood has matched Barnes for output and whilst his goal at the Hawthorns, a close range header after a rebound off goalkeeper Ben Foster, will not linger as long in the memory as Barnes’; all goals look the same on the scoresheet and Wood’s goal proved to be the one which secured all three points. As for Lennon, he seems to be a player rejuvenated since his arrival at Burnley. Whilst it would seem that “getting a tune” out of someone called Lennon wouldn’t be too difficult, during his injury-punctuated time with Everton, it looked as though his was a talent falling fallow, there have been too his well-publicised problems with depression. It is therefore gratifying that the move to Burnley seems to have re-invigorated him and long may that continue, for in the short time that he has been with the club, he has proved a reliable and accurate supply-line for Barnes and Wood. So Burnley remain in seventh place, clinging onto their hopes of European football next season. Arsenal, who are currently in sixth place are keeping Burnley at arm’s length, whilst simultaneously Burnley are holding off Leicester in eighth. It promises to be an intriguing climax to the season. This rather Burnley centric match review was written by uber Clarets fan Dave Thornley, who contributes regularly to Clarets Mad (TEC).